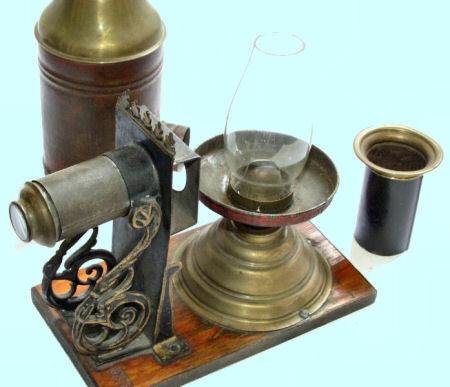 Max Dannhorn was one of the German magic lantern manufacturers who founded their companies in Neuremberg. Dannhorn started in 1872. 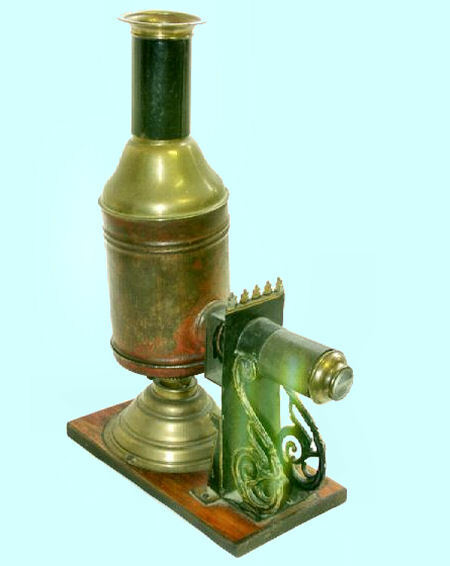 While other great companies like Ernst Plank, Carette, Schoener and Bing also dealt in other toys like steam engines and trains, Dannhorn dealt exclusively in magic lanterns. The Dannhorn trade mark was rarely applied to their products; some of them however can be identified by the initials M.D. and/or a picture of a fir tree and a horn. Dannhorn's lanterns attract attention by their extraordinary beauty. 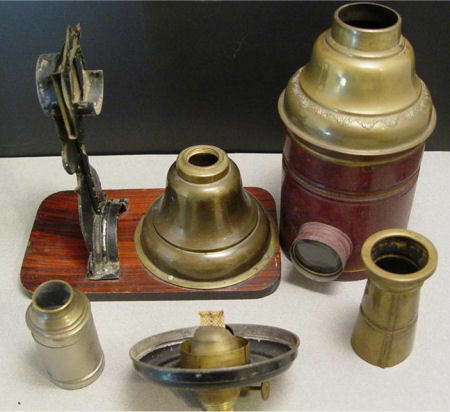 They are abundantly provided with curly ornaments and mostly made of fine burnishing brass. After World War I the firm was in a weak condition and in 1921 most of Dannhorn's shares were sold to 'Gebrüder Bing' (G.B.N.). Almost all Dannhorn's magic lanterns have beautiful, rich ornamented lens carriers in a great variety. 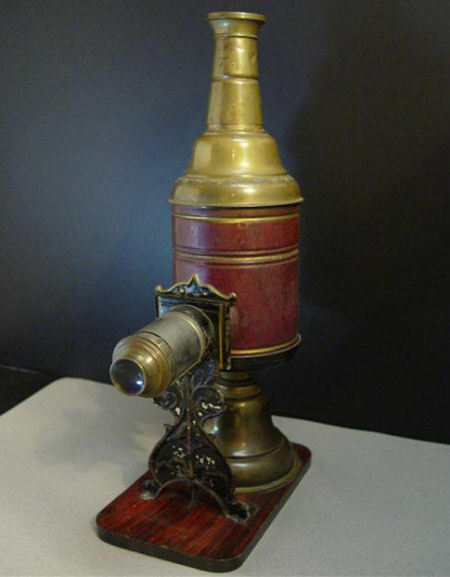 Also this remarkable high magic lantern made by Max Dannhorn has a very beautiful lens carrier. 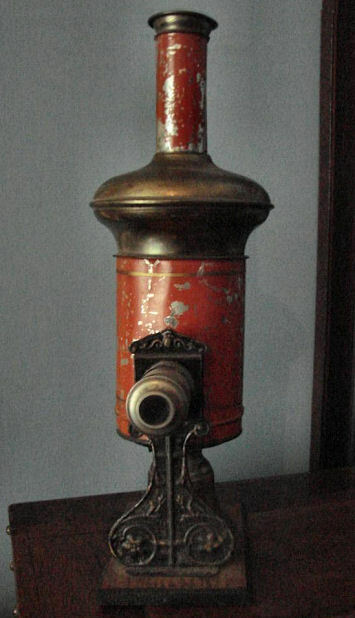 Roof and foot are made of brass, the lamp house is made of red painted tin. Height: 35 cm. Black painted messing body. The lens holder supplied with the distinctive Max Dannhorn ornaments. Sizes: 8 x 16 x 23 cm including the chimney. 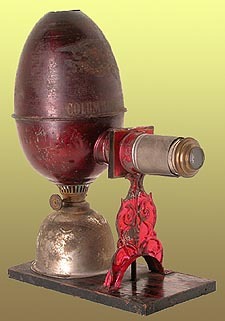 Suitable for 3 cm magic lantern slides. 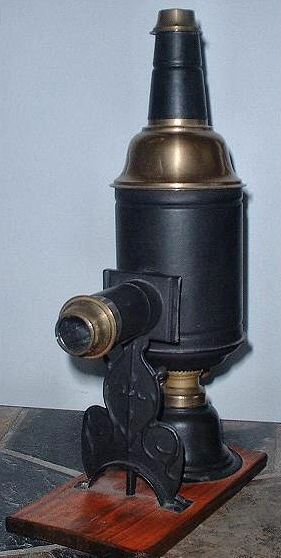 Brass lamp house. 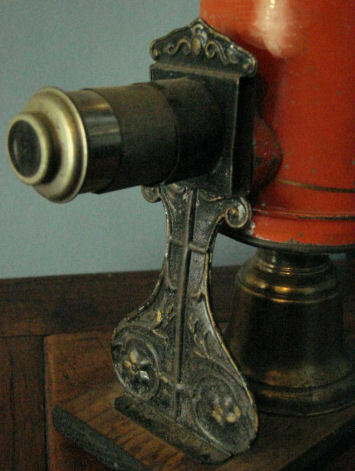 Lens holder ornamented with distinctive Max Dannhorn design. 1895. 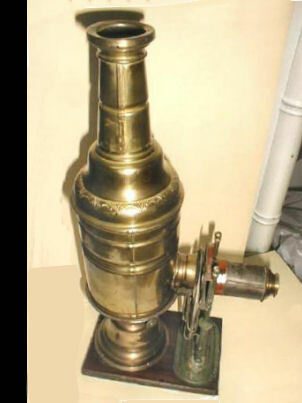 Polished brass lamp house, bell-shaped lamp base. Striking lens holder. Height 37 cm (14.5"). 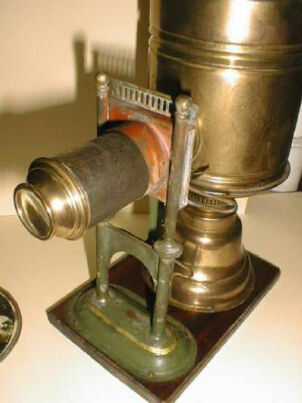 Magic lantern made of tin, brass and wood. Size: 38 cm height! The wooden base measures 19 x 12 cm. 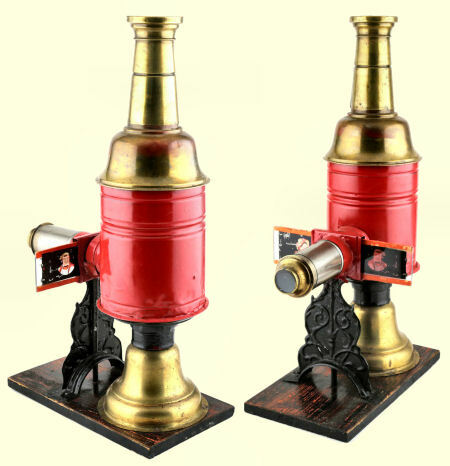 Red lacquered lamp house, polished brass bell-shaped lamp base, roof and chimney. Outstanding lens holder. Height 23 cm (9"). Ceramic lanterns are very exceptional. Only a few models are known: this spherical model, made by Max Dannhorn, and one or two rectangular models, made by Johann Falk. Splendid lantern with spherical ceramic hand painted and glazed lamp house. 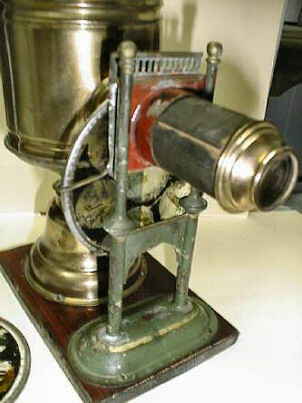 Oil reservoir and lens support on wooden base. 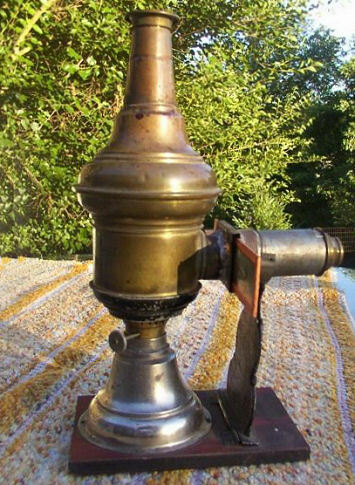 Straight chimney with brass flanges. Produced with several flower decorations. This lantern is breakable and therefore only seldom found nowadays. 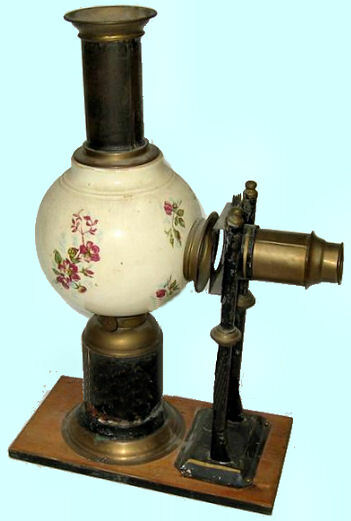 Height: 11" (28 cm); diameter lamp house 4" (10 cm). 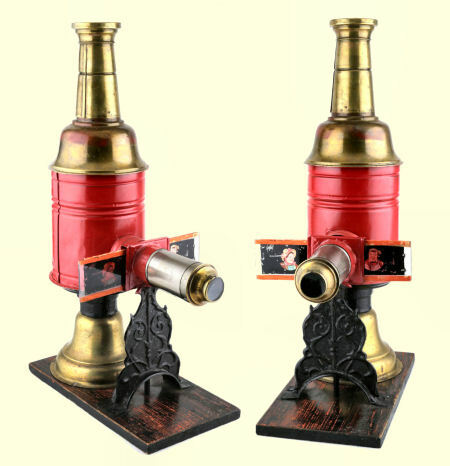 This striking magic lantern, finished in dark red with decorative polychrome lens support on wooden base, is called 'Columbus'. Any idea why.......? Height 7" (18 cm), diameter lamp house 3.5" (8.5 cm). 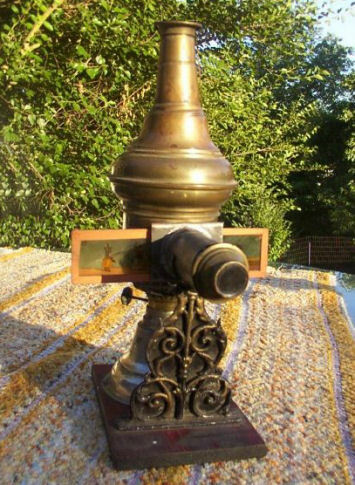 The name COLUMBUS is painted in golden capitals on the lamp house.